Windows 8 has been already released with the developer preview edition for the public which can bedownloaded and installed by anyone who wish to try out the the most anticipated operating system from Microsoft. Millions of users have already downloaded the preview edition. If you wish to try out you can alsoDownload Windows 8 Developer Preview Edition. It has been known to almost all of the Windows fans that the new Windows 8 will have a new start screen based on live tiles except the traditional icons based desktop for application shortcuts. 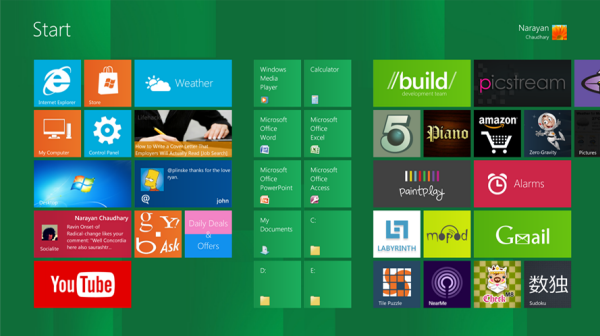 The Windows 8 start screen shows a live tiles of all application that are built in Windows 8 and shortcuts that you may set by yourself. Now you can Download Windows 8 Start Screen for any Windows version. We have already shared few Transformation Packs and Skin Packs of Windows 8 for the users who are usingWindows 7 , Vista and Windows XP and wish to try out the look and feel of the upcoming Windows version. We recently discovered another creation from a deviantart artist who created an awesome app to bring ‘Start Screen’ of Windows 8 to your desktop of Windows 7, Vista and XP. It mimics the Start Screen with the exact screen scrolling effect. You can drag/scroll the screen to left or right by dragging the tiles. This is the closest resemblance of Windows 8 Start Screen we’ve found so far. · Mopod Tile to play music, Angry Birds Game, Fruit Ninja Game and limitless. 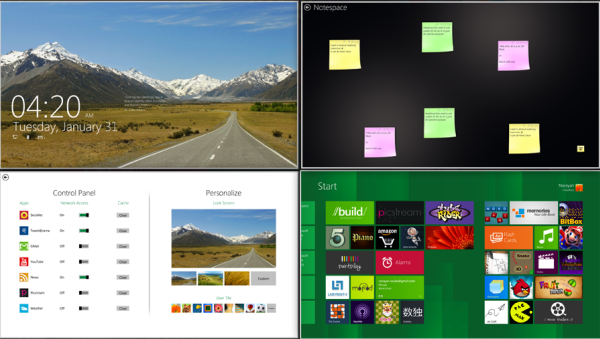 You also get lock screen similar to the one which is in Windows 8. This application can be installed on Windows 7, Vista and XP (both 32 and 64-bit version).